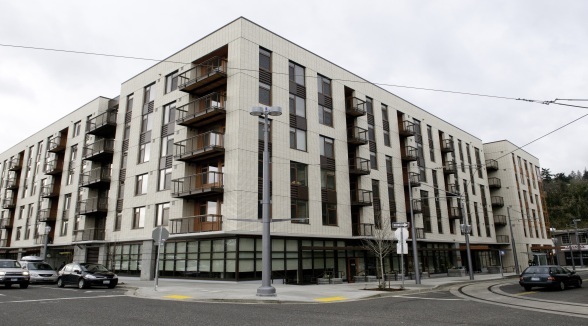 Gray’s Landing, located on the corner of SW Lowell and SW Bond, offers affordable apartments in the South Waterfront and will provide residents with easy access to sophisticated urban living in a natural setting along the Willamette River. Gray’s Landing is the first affordable housing development in the South Waterfront community. Gray’s Landing provides affordable housing to households earning 60% of Median Family Income. Forty two (42) of the apartments are targeted to veterans. Gray’s Landing offers studio, one and two bedroom apartments. This is a tax credit, affordable building. Learn more about Tax Credit units. Breathe easy. Smoking is not allowed in any REACH property. Gray’s Landing offers an array of transportation options including the Portland Aerial Tram, Portland Streetcar NS Line, bus services #35 and 36 along with biking and walking trails. Gray’s Landing gives you access to all that downtown Portland has to offer! A walking bridge is under construction, taking pedestrians over I-5 to connect to the Lair Hill neighborhood. By 2015, the new transit bridge over the Willamette will be in service, linking walkers, bikers, and transit riders with East Portland.